Social-enhancer is a search tool you might find set as a homepage and a New Tab URL on your browser. It should be compatible with Google Chrome only; however, if you discover it on Mozilla Firefox or Internet Explorer too, you should know that the extension called Social Enhancer has been successfully added to the list of add-ons on your browser. Some users download it from the Chrome Web store (https://chrome.google.com/webstore/detail/imagesearch-enhancer/liemnpdalagghghhofblgohoaaaddjfk?hl=en-US) willingly, but there are still more users out there who cannot explain where this piece of software has come from. No matter you willingly install Social Enhancer or it enters your PC in a software bundle without permission, you will discover a new homepage and New Tab page in any case. Many users find those changes undesirable, and if you are one of them, you should go to delete the suspicious extension from your browser today. Actually, it would be best to remove it even if you do not think that a new URL set without your permission on browsers is not a huge problem. The following paragraphs of this article will explain to you in detail why this browser extension is better known as a potentially unwanted application and what to do to get rid of it. What makes the Search Enhancer extension untrustworthy is the fact that it does not inform users in advance that it is going to set a search tool Social-enhancer (http://social-enhancer.com/) on their browsers. Reputable applications never act like this, so, as a consequence, this piece of software cannot be called fully trustworthy. 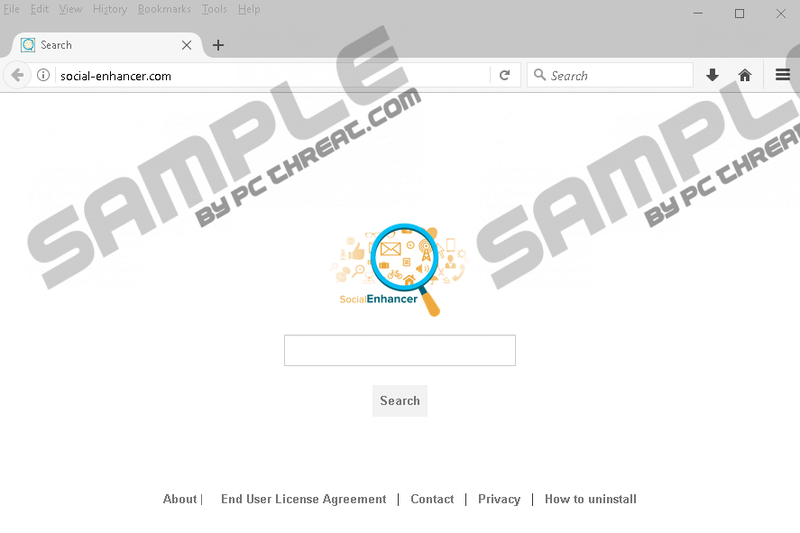 This search provider looks a legitimate search tool, but we still cannot call it trustworthy because, as thorough research carried out by specialists at pcthreat.com has shown, this search provider might present users with the sponsored search results even though it is powered by Yahoo!, which is known to be a reputable search engine. These modified search results might be placed among decent search results, so you will not even notice when you click on them. Malware should not be automatically dropped on your PC when you click on such a link, but you might end up against your will on a website with untrustworthy software. Needless to say, its content will not have anything in common with the entered search query. This is one of the main reasons the Search Enhancer extension needs to be removed from the system as soon as possible – there is no other way to remove the undesirable search tool from the browser. The other reason it is not very smart to keep it is the fact that information about you might be collected every day if you do nothing. The so-called sensitive information should not be stolen from you, but it is only a question of time when the non-personally identifiable information ends up in the hands of the Search Enhancer developer. What you can do about that is to disable the extension to stop the information collection. Although it is possible to download the Search Enhancer extension from the Chrome Web store with the click on the Add to Chrome button, the majority of users who discover http://social-enhancer.com/ set on their browsers do not know anything about its entrance, which suggests that it is mainly distributed in bundled malicious installers. Bundling is a popular deceptive method often used to distribute untrustworthy applications, so if your PC is unprotected and you are one of those users who tend to download free software from various file-sharing pages, we are 99% sure that your system will become infected with malware again soon. Of course, you can make sure that this does not happen to you by ensuring the maximum system’s protection. You can do this by acquiring and enabling special automatic software for protecting your PC. You will no longer see the undesirable search tool Social-enhancer set as your homepage and a New Tab URL only if you delete the extension Search Enhancer. It is not a task you could not accomplish, we are sure, but we have still provided the manual removal guide below this article – feel free to use it if you feel that you need some help. The automatic method, i.e. scanning the system with an automated scanner is much quicker, so you should adopt it instead of the manual one if you are a busy person. Tap Alt+T and select Manage add-ons. Under Toolbars and Extensions, select the undesirable extension and click Remove. Open your Mozilla Firefox browser and press Ctrl+Shift+A simultaneously. Start Google Chrome and click the button in the top-right corner. Select the extension you wish to remove and click on the Recycle bin button. Confirm the removal of the undesirable extension by clicking Remove in the pop-up window. Quick & tested solution for Social-enhancer removal.